Did you know that replacing missing teeth has substantial benefits for your health and your appearance? A full denture replaces all your natural teeth and provides support for cheeks and lips, as without this support, sagging facial muscles can make a person appear older and by replacing missing teeth, dentures improve a person’s ability to speak and eat. 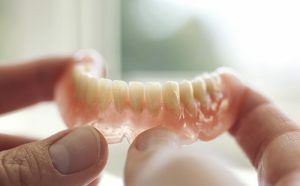 Dentures can be “conventional” or immediate” according to when they are made and inserted into your mouth. Conventional dentures are made and inserted after your remaining teeth are removed and the tissues have healed, which may take several months. Immediate dentures are inserted immediately after the removal of the remaining teeth. To make this possible, Dr. Kostides measures and creates models of his patient’s jaws during a preliminary visit. The advantage of immediate dentures is that the wearer does not have to be without teeth during the healing period. However, bones and gums may shrink over time, especially during the healing period. When gums shrink, immediate dentures may require relining to fit properly. Dr. Kostides may fit you with an over-denture, which fits over a small number of remaining natural teeth providing stability and support for your denture. Dr. Kostides can determine if an over-denture is suitable for you. Dr. Kostides also offers his patients the opportunity of having their full or partial denture secured with dental implants. Your partial or full denture can be attached to implants to give you the next best thing to your own teeth, a fabricated, custom fitted denture that won’t move. This option offers superior function and beautiful esthetics. You can rediscover the comfort and confidence to eat, speak, laugh and smile with a denture that is solidly secured with dental implants! Your new dentures may feel awkward for a few weeks until you become accustomed to them. The dentures may feel loose while the muscles of your cheek and tongue learn to keep them in place. It is not unusual to experience minor irritation or soreness and you may find that saliva flow temporarily increases. As your mouth becomes accustomed to the dentures, these problems should diminish. 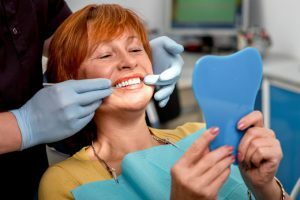 One or more follow-up appointments with Dr. Kostides are generally needed after a denture is inserted. If any problem persists, particularly irritation or soreness, contact Dr. Kostides. Even with a full denture, you still need to take good care of your mouth. Every morning, brush your gums, tongue and palate with a soft-bristled brush before you put in your dentures. This removes plaque and stimulates circulation in the mouth. Selecting a balanced diet for proper nutrition is also important for maintaining a healthy mouth. Dr. Kostides will advise you about how often to visit, as regular dental check-ups are important. Dr. Kostides will examine your mouth to see if your dentures continue to fit properly, as well as examining your mouth for signs of oral diseases, including cancer!